Coming Soon: Caverns of Chaos! Introducing our first endlessly replayable, randomized dungeon: the Caverns of Chaos! Upon completing a level 15 adventure, Gary will tell you he’s ready to GM this totally new module. 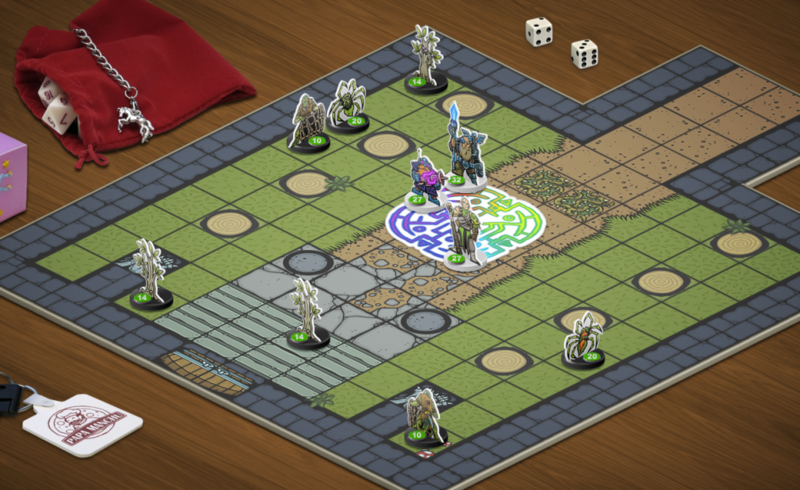 The first battle might be a tough one for first time spelunkers: at the entrance to the caverns, your party is confronted by a random selection of powerful monsters pulled from anywhere in Cardhuntria. Things only get weirder, from there, as the next several battles take place on randomized battlefields, and your own party’s makeup and abilities will be shuffled as you progress. No two fights will be the same! 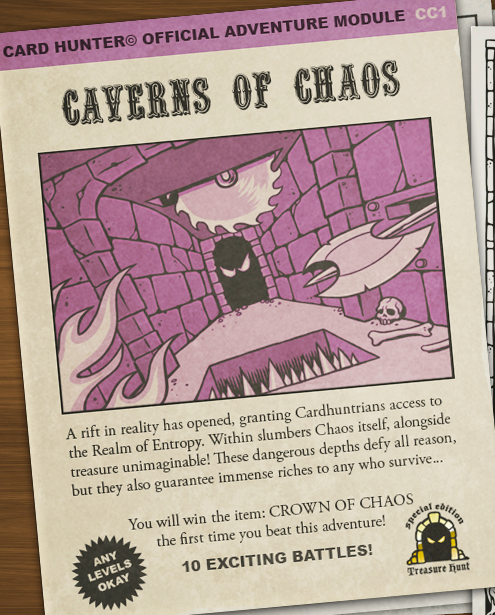 Caverns of Chaos is a treasure hunt, and the final reward for beating the adventure is a priceless legendary treasure, obtainable only by completing the adventure: the Crown of Chaos! To win it, though, you’ll need to beat ten increasingly difficult battles in a row without losing—there are no retries, as the magic of the caverns expels any exhausted adventurers. Actually completing the Caverns of Chaos may be extremely difficult, but the random battles are a fun and fresh experience every time that allow players with a wide range of skill to taste this new mode. The rewards are good, too, with each battle after the first guaranteeing a rare or better item (the last three battles reward epics or better). We expect this to be the best farming spot in singleplayer, with a loot rate similar to high-level ranked play. Club members rejoice! 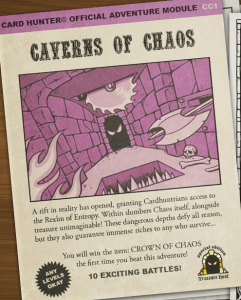 Completing the Caverns of Chaos will also unlock the special adventure Return to the Caverns of Chaos, which consists of the same ten battles, but allows you to use your constructed party on every stage. If you ever wanted to put your level 23 characters to the test, this is it. Caverns of Chaos will go live on October 13th, alongside Mauve Manticore 10, the winning items from Aloyzo’s Arsenal 3, and our regularly scheduled Halloween content. Oh, and one more thing… it’ll be free! Very grateful for the free content especially the currency of my country is very undervalued and the dollar is very expensive. Just wondering here, is it possible to get 2-3 alabaster dragons at the end level? I was amazed at how well-balanced this game is until Caverns of Chaos. Long, hard, and you can’t prepare because you get random opponents and/or players. What a shame. I wish card hunter remembered card loadouts for each adventure, then I don’t have to manually change my cards when repeating certain adventures.